Italian President Giorgio Napolitano has been holding crisis talks following the resignation of PM Romano Prodi after just 10 months in office. Mr Prodi quit after several of his centre-left coalition partners opposed troop deployments in Afghanistan and plans to expand a US airbase in Italy. Mr Napolitano may call new elections if agreement is not reached on forming a new coalition government. Mr Prodi will stay on as caretaker prime minister in the meantime. The talks are expected to last well into Friday, the president's office has said. The government was brought down by two communist senators who rebelled against their own parties. One of them, Franco Turigliatto, a Trotskyite, is facing expulsion procedures from the Communist Refoundation Party for not being "in line with the [party's] democratic will". The other rebel, Fernando Rossi, has already announced he will resign. 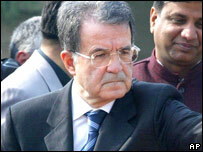 The BBC's Mark Duff in Milan says the smart money is on a much-weakened Mr Prodi being offered a new mandate to govern. If so, he could return at the head of a new centre-left coalition, possibly including the opposition Christian Democrats. Failing that, our correspondent says, the president may feel obliged to construct a temporary government of technocrats to hold the fort - and push through urgent measures like pensions reform and the next year's budget. Mr Napolitano cut short a trip to Bologna to return to Rome for talks with Mr Prodi on Wednesday, during which his prime minister tendered his resignation. The president has now begun consulting party leaders on the formation of a new government. Senate Speaker Franco Marini, lower house counterpart Fausto Bertinotti and the heads of parliamentary groups are meeting Mr Napolitano. If agreement cannot be reached, Mr Napolitano could call early elections, although it would be well ahead of their scheduled date in 2011. The coalition's leader in the lower house of parliament, Dario Franceschini, said the main groups in the nine-party governing alliance would continue to back Mr Prodi. There were dramatic scenes in the upper house, the Senate, on Wednesday as the government lost its motion by just two votes. The result was met by cries of "resign! resign!" 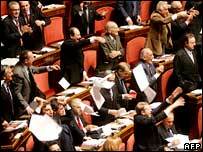 by right-wing senators, and the sitting was suspended shortly afterwards. The motion had asked the Senate to approve the government's foreign policy, a policy which it said was inspired by a repudiation of war and respect for the role of the EU, UN and international alliances. Although it was not a formal confidence vote, Foreign Minister Massimo D'Alema had urged the government to resign if it could not win backing for its foreign policy. Mr Prodi's government had been forced on the defensive over the continued deployment of 2,000 Italian troops in Afghanistan, with strong opposition from some of his more left-wing coalition partners. Plans for the expansion of a big US military base in Vicenza, northern Italy, had also sparked protests both within his government and on the street, with large demonstrations in Vicenza at the weekend. US President George W Bush wants to strengthen the base by transferring from Germany to Italy another 2,000 US soldiers, taking the total number stationed in Vicenza to nearly 5,000. Mr D'Alema told the senate that to renege on the approval given by Mr Prodi last month for the base's expansion would be a "hostile act" towards the US.